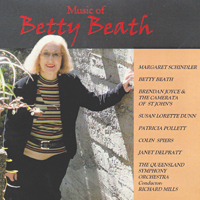 Features a selection of Betty’s music performed by Betty Beath, Margaret Schindler, Janet Delpratt, Susan Dunn, Patricia Pollett, Colin Spiers, the string orchestra Camerata of St. John’s with Brendan Joyce, Queensland Symphony Orchestra with Richard Mills conducting. The fourteen page booklet includes biographical and program notes. Available to order online for AUD $25.00 from Wirripang or The Australian Music Centre. The album is also available to download from iTunes for AUD $16.99.